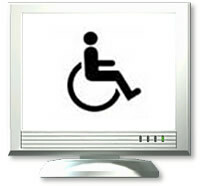 This website was developed to the accessibility guidelines formulated by the World Wide Web Consortium (W3C) under the Web Accessibility Initiative (WAI). More specifically, Web Content Accessibility Guidelines 1.0 (WCAG 1.0), level AA, were followed, further to the accessibility requirements for Government or Government-funded websites laid down in Spanish Royal Decree 1494/2007 of 12 November (Article 5). use of redundant and consistent navigation mechanisms throughout the site. The validation tools used to verify site accessibility were as follows.